Before I moved from Minnesota to Connecticut, I’m not sure I had ever tasted gnocchi. I feel like if I was living my mid-twenties in Minneapolis now versus five years ago, that might be different because of an ever-evolving restaurant scene. However, maybe it isn’t the fault of a mostly Scandinavian demographic and meat-and-potatoes dominated food scene, but of my own expanding food horizons. Either way, I credit the butternut squash gnocchi at Zaza Gastrobar in Stamford for making gnocchi a must-order item for me, anytime I see it on a restaurant menu. Their version consists of gnocchi–bite-sized, fluffy potato dumplings formed from a simple, but slightly finicky, dough–and tiny butternut squash cubes coated in a light golden butternut squash and cream sauce. After repeatedly shelling out over $10 for an appetizer-sized dish that surely cost around $1.23 (or less) to prepare, those pillowy dumplings got banked in the back of my mind with other seemingly, but not actually, complicated favorites to learn to make at home. I pinned some recipes for gluten-free gnocchi, but when I finally and suddenly was inspired to cross these babies off my “to make” list, I figured I should master the traditional method first. Go figure, I’ve crossed one item off my list, but replaced it with the gluten-free version. However, unless you’re plagued with celiac disease (in which case, please wait patiently for my gluten-free iteration! ), I highly encourage you to make an exception in your otherwise low-gluten diet for these. And if you couldn’t care less about the gluten hysteria, party on and make a double batch of these guys a.s.a.p. There’s an awesome sauce (awesome sauce–hehe) of tomato, roasted red peppers, greens, and truffled goat cheese that I cooked up to serve beneath my gnocchi, but I thought it most logical to first conquer the gnocchi tutorial. I drew upon a few sources for this endeavor, and, as always, America’s Test Kitchen must be given lots of credit, although the methodology and extra tips are per my execution. I’ve broken the process down into major steps, with lots of detail, especially regarding the pitfalls I encountered. My most important advice is this: don’t try to take pictures of the process. At least not on your first attempt. The photographs below are accurate; however, the amount of time I spent shooting between steps caused moisture and temperature issues with my dough, contributing to a too-sticky result. Read on to avoid that, and other common, mistakes. And do take a picture when you’re finished, posting it to Insta and tagging me or hashtagging it #nckhomemade. I’d love to see how it turned out or field your questions. 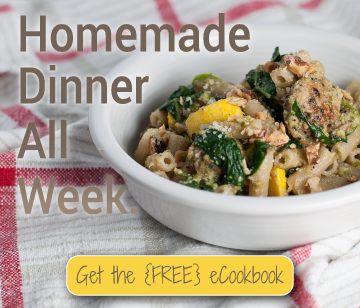 There’s a printable version of the recipe at the end of this post–just scroll down or click here. Please don’t walk away here. I know you don’t want to buy a potato ricer. Neither did I. That’s why it took me so long to even get to the point of making homemade gnocchi. But you know what? It’s a pretty cool gadget that can do lots of things besides “rice” potatoes. Like squeezing water out of cooked greens, which I painstakingly did by hand at Thanksgiving. I was also excited to read that the coarse setting on my ricer could be used to “chop” hard boiled eggs for egg salad. Yum, yum, and yum. Links are to any specific products that I both own and recommend (and if you really want to know, they are not affiliate links at this time). America’s Test Kitchen provides volume measurements if you want to forego the scale. Since I prefer the accuracy of cooking by weight, especially where dough is involved, I haven’t tested the volume measurements or included them here. Once you have your equipment and ingredients ready, take a deep breath, leave yourself plenty of time, and get mixing, rolling, and eating! Baking the potatoes (versus boiling) keeps them from soaking up extra water which, when forming gnocchi dough, is the enemy, throwing off expected ratios of potatoes and flour. Preheat the oven to 400 degrees while you wash and dry the potatoes, then carefully poke them all over with a fork (in about 10 to 12 evenly spaced places). Place directly on the middle oven rack and bake until easily speared lengthwise with a skewer, about 50 minutes. It’s better to over bake the potatoes, if in doubt. I wasn’t careful about taking the potatoes out of the oven precisely when finished. When I checked them at 40 or 45 minutes, they weren’t quite soft, so I let them go about 1 hour every time I made the recipe (my oven runs low). 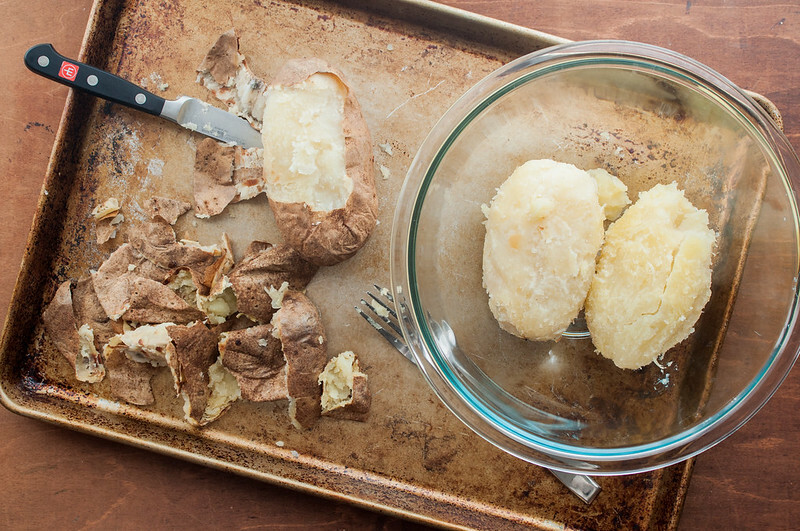 The potatoes should have the consistency of a baked potato, not undercooked in any places. Take advantage of the baking time to read through the remaining steps and get things as ready as possible. When the potatoes are done, you won’t need to move frantically, but moving through the steps without long breaks increases the likelihood of perfect gnocchi. If the potatoes are way too hot to handle when they come out of the oven, let cool for 5 minutes. Working on the baking tray, use the knife to peel the potatoes and place them in the mixing bowl. If you’re used to handling hot food with bare hands (as I’m becoming), make one cut and then use your hands to “unwrap” the peel from the potato. Roughly quarter the potatoes using your hands or a knife. Discard the skins and place a couple layers of paper towels or a clean dish towel on the baking tray. Set your ricer to the finest setting (if there are multiple), and pass the potato pieces through the ricer, distributing them evenly over the towels. The towels will soak up moisture from beneath, and the thin layer of potatoes will allow maximum steam (water–bad!) to escape. Cool for 5 minutes on the towels, then measure 16 ounces (1 pound) of riced potatoes and put them back into the mixing bowl while still warm. The second and third time I made the recipe, I noticed some very small lumps. Since I was aiming for perfection, I passed the potatoes through the ricer a second time. If your ricer setting is coarse or you notice lumps, I’d recommend this method for extra smooth gnocchi. If a bit of potato sticks to the towels, it’s fine. Two plus pounds of potatoes provides more than 1 lb. of riced potatoes, so minimal lost potatoes won’t upset the recipe. For this and the next step, the video at America’s Test Kitchen for members is a great resource (around the 4 minute mark). Lightly beat the egg and pour it over the potatoes in the bowl. Mix with a fork until just incorporated–it shouldn’t be thoroughly mixed or smooth yet. Sift (or sprinkle) all the flour over the potato and egg mixture, then sprinkle the salt over it. Gently fold with the fork to combine until a crumbly, not completely cohesive dough starts to form. If you think to yourself that it looks too crumbly to be dough, but there are no big pockets of dry flour, you should likely stop mixing. If you’ve never made bread or a similar dough before, this step may seem scary, but just keep in mind that 1) mistakes are a learning experience and 2) your goal is to avoid overworking the glutens in the flour, so err on the side of undermixing at this step. Do not incorporate the flour in batches. The flour added first will become overworked, creating a sticky dough that’s impossible to roll out and make gnocchi out of. Sifting is optional. It should help keep the gnocchi dough lump free, but I tried it both ways and didn’t encounter issues with sprinkling it over the potato and egg mixture. Sprinkle a little flour over whatever clean, large workspace you’re using (I prefer my granite countertop). Press the crumbly dough in the bowl together with your hands once, then dump it onto the counter. The goal of kneading the dough is to achieve a smooth dough with a consistent texture throughout, so once you reach this point, stop kneading. No good comes from over-kneading the dough. Work with your hands, but don’t work the dough like playdough with your fingertips. You still want to minimize hand-to-dough contact so the glutens in the flour don’t become overworked and sticky. The three times I made the recipe, the guideline to knead for about a minute held constant. The one time I kneaded longer, my dough got too sticky. Sprinkle the work surface and dough with a little more flour during the process, if it starts to stick to your counter or hands. This is the trickiest, most sensitive step. Stick with it! If you have trouble or questions, leave me a comment or send an email so I can try to help troubleshoot. The hardest part is behind you! Use the bench scraper or a knife to cut the dough, like a pie, into eight equal pieces. This keeps the rolled out dough “ropes” from getting too long and, therefore, difficult to work with. 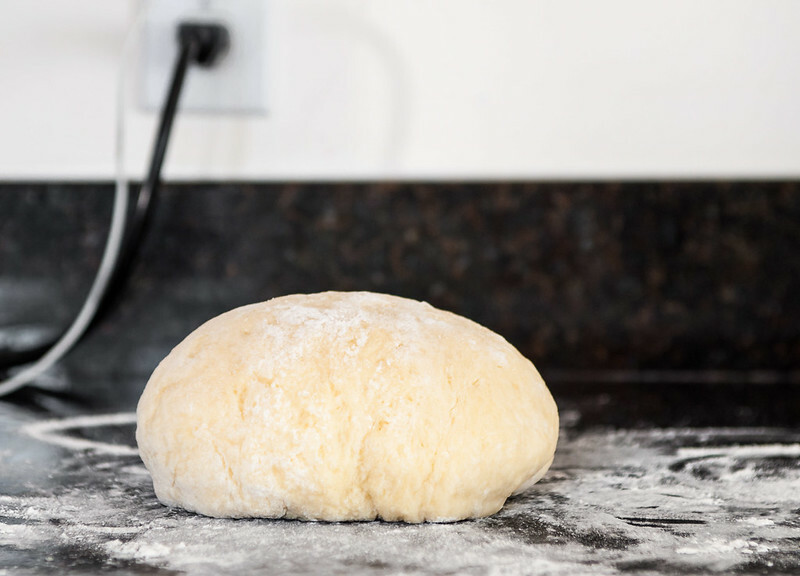 Keeping your work surface lightly floured, roll each piece of dough with your hands into a rope 1/2 inch in diameter. Once all the ropes are rolled out, use a bench scraper or knife to cut the ropes into 3/4 inch long pieces. 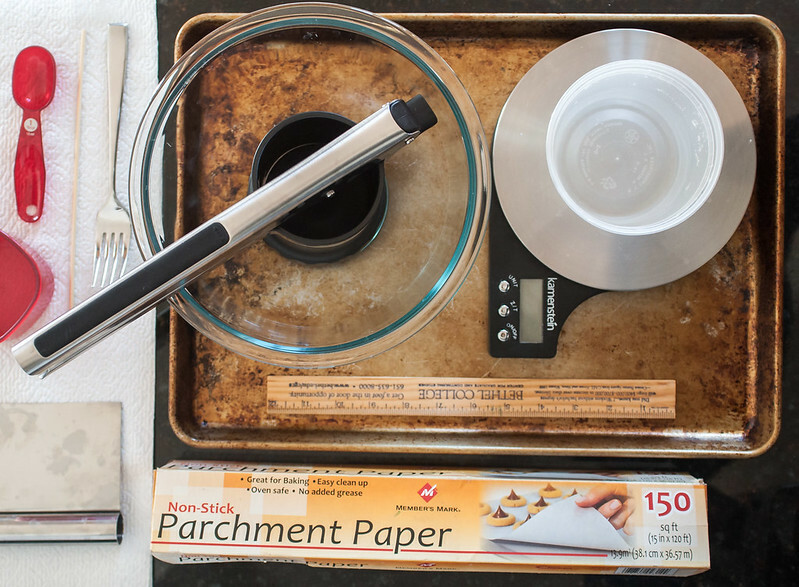 Line the rimmed baking sheet with parchment paper and sprinkle with extra flour. 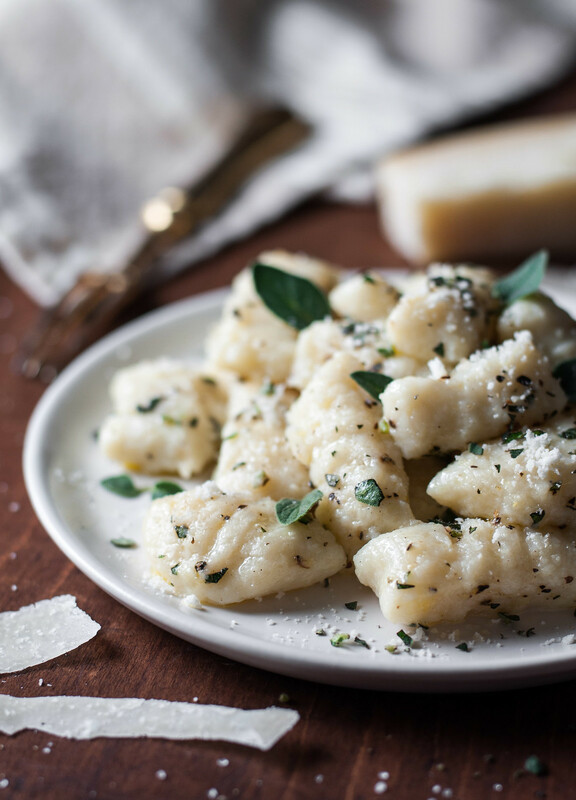 If you’d like smooth gnocchi (or are feeling lazy), place the little gnocchi pillows onto the parchment so none of them are touching each other, then follow the cooking or storage instructions in the next step. For more traditional ridged gnocchi, which hold onto sauce like a pro, continue to the next step. If your dough is very sticky while trying to roll it into ropes, you either need more flour on your work surface, or the glutens were overworked while kneading. If the latter occurred, you can try to gently and patiently work with the dough to salvage it–the texture may not be completely ruined. If you suspect this is the case, I recommend forming a few gnocchi, then test cooking them as in the next step to see if they are satisfactory or should be tossed. This happened to me during testing once. Don’t lose heart–the ingredients are inexpensive and, if you paid attention, it’s unlikely you’ll repeat your mistake. If your dough is very spongy and stays in one place while you try to roll it out, you may have too much flour on the work surface, or you may have overworked the glutens in the dough, per the above point. Follow the recommendation there for how to proceed. Dip a clean, dry fork into a little flour, then turn it upside down. Place the cut side of a single gnocchi onto the back of the fork’s ridges, then use your thumb to roll it down toward the points. One side of the gnocchi will be ridged, and one will will have an indentation. Place finished gnocchi on the floured, parchment lined baking sheet. To test gnocchi before storing or to cook immediately, bring a medium saucepan of water (at least a few inches deep) to a gentle boil, which can be done while you cut and imprint the gnocchi. Gently drop a few finished gnocchi into the boiling water, and time them for 1 1/2 minutes (90 seconds). By that time, they should float to the surface. Use a slotted spoon or spider strainer to remove from the water, or cook up to 30 more seconds if not yet floating. Placing the cut side of the gnocchi on the fork tines may seem counterintuitive, but after trying one, you’ll end up with the “right” shape gnocchi dumpling. If fresh gnocchi don’t float after 2 minutes of boiling, give them a little more time, but this may indicate an issue with the dough meriting a fresh start. If serving gnocchi within 24 hours of preparation, cover the baking tray with plastic wrap and refrigerate. For longer storage, cover with plastic wrap and freeze until the gnocchi are solid (no more than 12 hours). Seal frozen gnocchi in an airtight freezer bag or freezer-safe container, and freeze until needed. Cook gnocchi from frozen. In my experience, this adds only 30 seconds to a minute of cook time. Be simple or creative with the finished gnocchi. 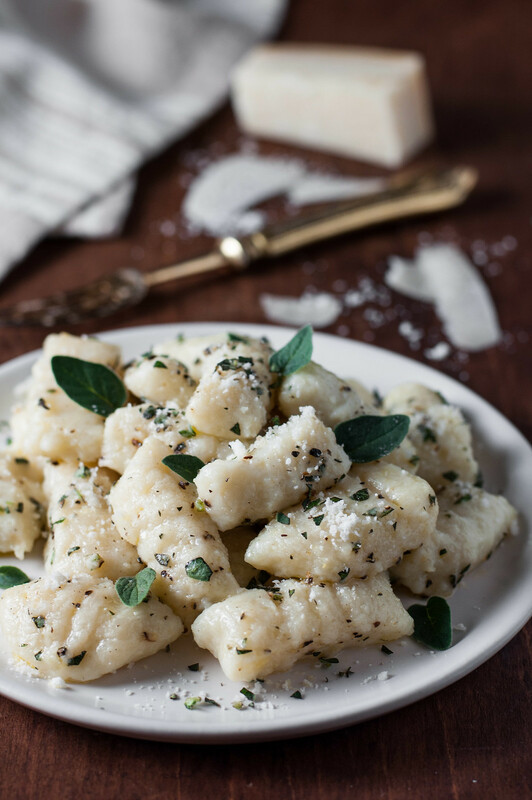 Most sauces or preparations for pasta will be great with gnocchi–just a little melted butter or olive oil, parmesan, salt and pepper, and fresh herbs is delicious. That’s exactly what I’ve done in the photos here, with some fresh, finely chopped oregano. 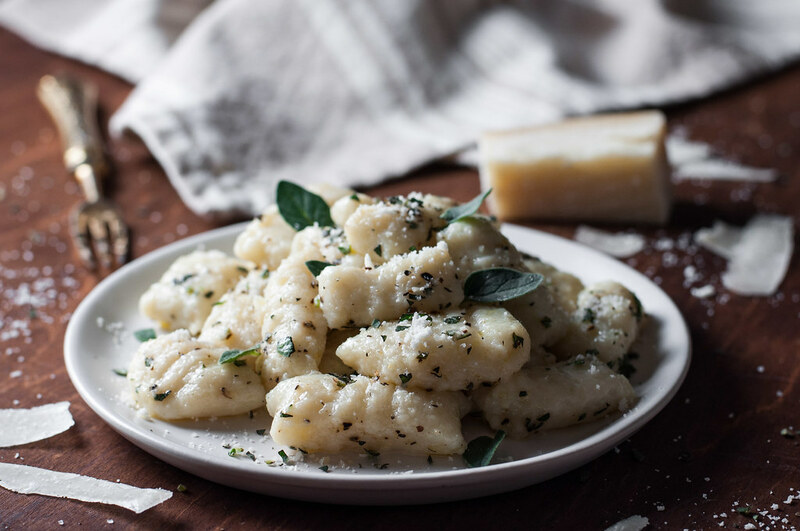 For pan fried gnocchi that are crisped and browned on the outside, cook the gnocchi in boiling water as directed above, and keep warm in a bowl with a little olive oil. Melt a tablespoon or two of butter in a nonstick skillet until bubbling, then add boiled gnocchi in batches, not crowding the pan. Cook a minute or two on each side, until browned, then remove to another bowl to keep warm with olive oil or a little extra melted butter. I keep a pan or bowl in a low oven, then place the browned gnocchi into it as I work through the batches. If serving the gnocchi with a heavier sauce, I like to plate the sauce first, then top it with a little pile of freshly cooked gnocchi, followed by any garnish (as you’ll see in my upcoming post for creamy roasted red pepper and wilted greens marinara). So that’s it! 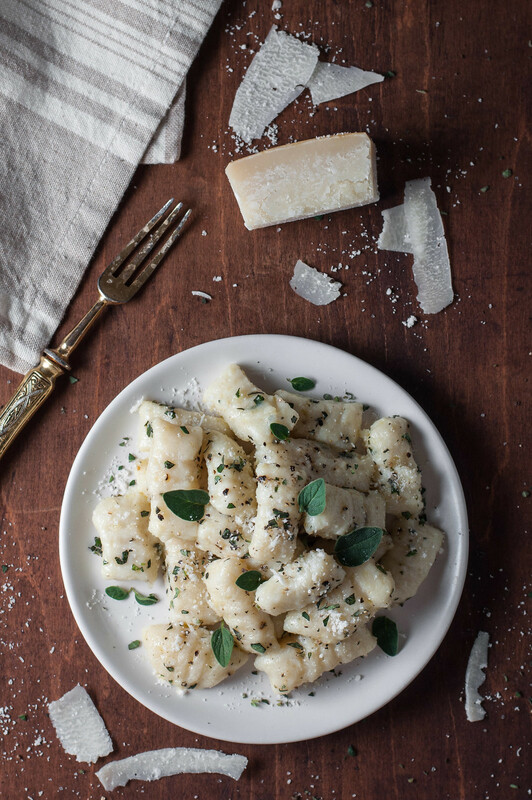 You made gnocchi yourself and realized that it doesn’t have to be impossible. If your first time wasn’t perfect (or was even a disaster), don’t let it get you down. I had a mini breakdown after my failed batch, but I salvaged what I could, cleaned up, and tried again the next day. That said, if you plan to make these for a dinner party: 1) good choice and 2) it makes sense to allow time for a test run in case of any issues (learned from my own experience). Homemade gnocchi is not an impossible quest. With a little practice and patience, enjoy fluffy potato pillows at home, as often as you like, for a fraction of the restaurant price tag. Preheat the oven to 400 degrees while you wash and dry the potatoes, then carefully poke them all over with a fork (in about 10 to 12 evenly spaced places). Place directly on the middle oven rack and bake until easily speared lengthwise with a skewer, about 50 minutes. While potatoes cook, gather tools and set up for remaining steps. Peel hot potatoes with a paring knife, break or cut roughly into quarters, and place in a medium, heatproof mixing bowl, discarding skins. 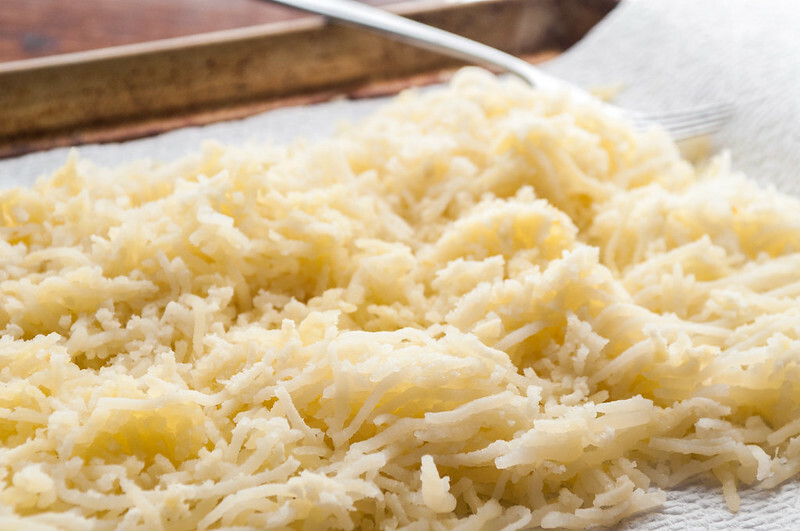 Pass potatoes through a potato ricer or food mill onto a baking tray lined with paper towels or a clean dish towel and cool 5 minutes. 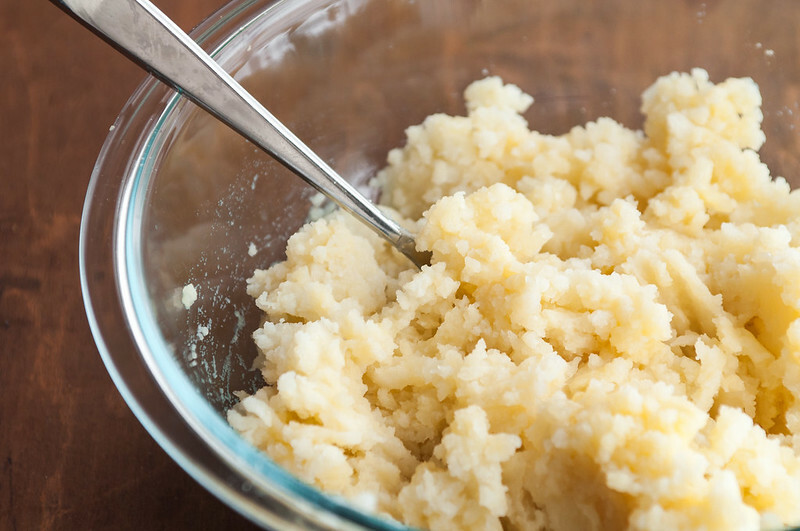 Weigh 16 ounces (1 pound) of riced potatoes and place into the mixing bowl. Save any extra potatoes for another use. Pour egg over potatoes and fold together with a fork until just combined. Sprinkle or sift 4 ounces flour and the salt into the bowl, again using the fork to gently combine until slightly crumbly but no dry pockets of flour remain. Press dough together with hands in one motion. Turn dough out onto a lightly floured, clean, dry work surface. Knead about 1 minute, pressing and folding dough over itself with your hands, until it just comes together into a smooth, consistent ball. Divide dough into eight approximately equal sized pieces. Flouring the work surface as needed, use hands to gently roll each piece into a rope ½" in diameter. Cut ropes into ¾" lengths. For smooth gnocchi, follow instructions below for storage and/or cooking. For ridged gnocchi, use thumb to roll each dumpling, starting with the cut side, over the back of the tines of a floured fork, from base to points. 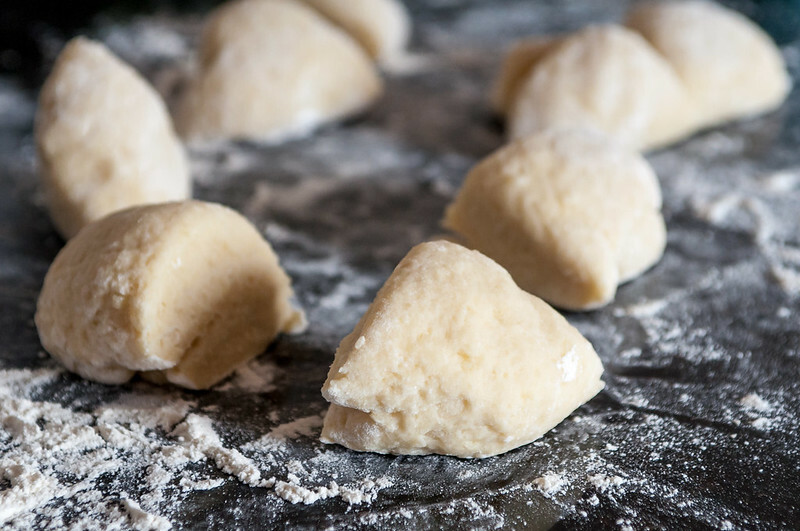 Place formed gnocchi onto a floured, parchment-lined baking tray. To cook or test a few gnocchi, gently drop into a pot of boiling water. Boil gently for 90 seconds to 2 minutes, until just after gnocchi float to the surface. Remove with a slotted spoon or spider strainer. Serve immediately, or keep warm in a bowl with a bit of olive oil. To brown gnocchi for a crisped, flavorful exterior, cook in batches in a nonstick skillet in butter melted over medium heat, a minute or two on each side. To store gnocchi, refrigerate on baking tray, covered in plastic wrap, up to 24 hours. Or, freeze the same way until hardened, then transfer to an airtight, freezer safe container. Frozen gnocchi require about 30 seconds to 1 minute longer cooking time. 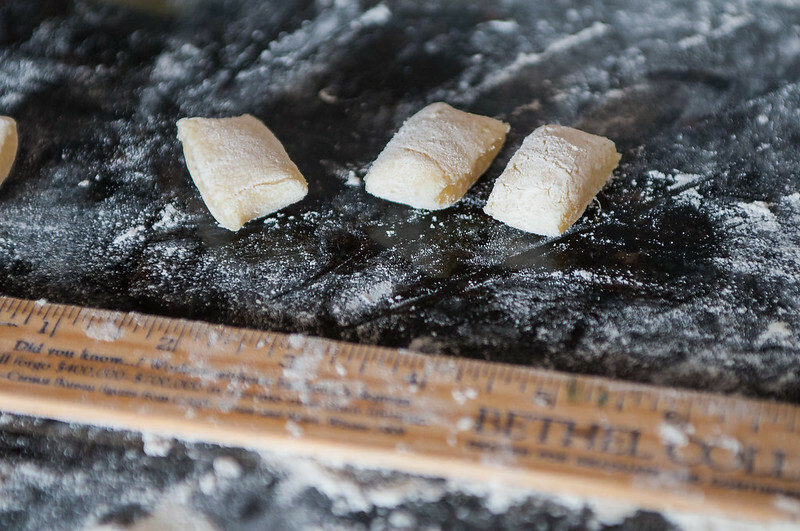 Measuring ingredients by weight for first-time gnocchi makers is imperative. Accurate, inexpensive kitchen scales are widely available. Due to the quantity of egg, I wouldn't recommend adjusting the yield of the recipe. If you need more or fewer gnocchi, either repeat the recipe in batches or freeze extra gnocchi for later. Egg isn't always considered a traditional gnocchi ingredient, but it's extremely helpful in achieving proper consistency of the dough so the dumplings hold together while cooking. 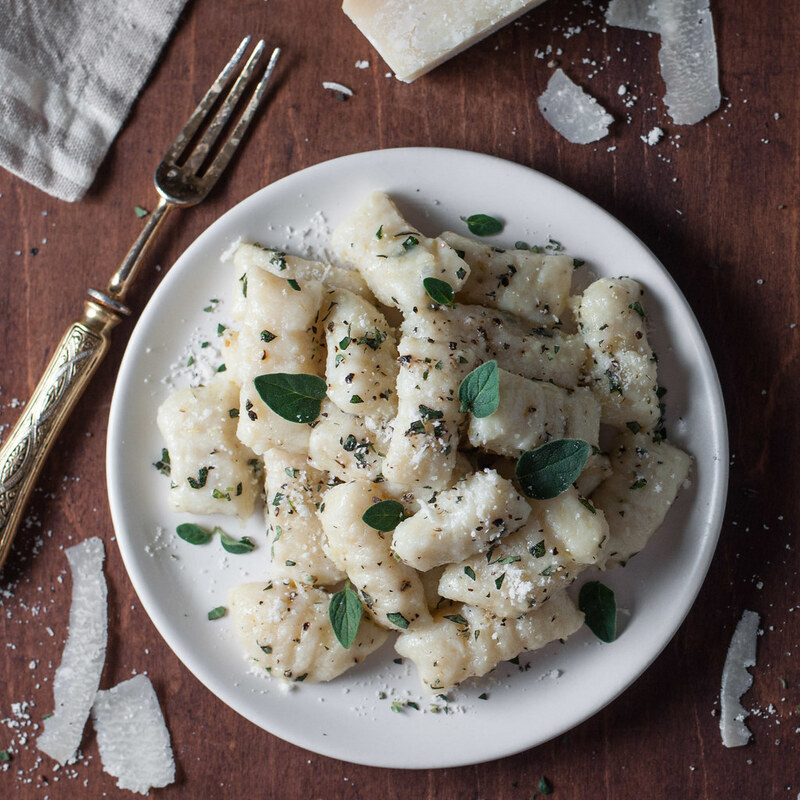 I never prepared gnocchi, this recipe looks great. I will try to cook them myself. Let me know how it goes! I found it to be less complicated than I imagined.